We have a cast for the reading of “Like a Loss,” the ten-minute play in the Hawking timeline! Both these talented people have been part of the telling of Mrs. Hawking’s story before. Brad you may remember from the Bare Bones reading of Mrs. Hawking, in which he played the villain Lord Cedric Brockton. He is an experienced actor onstage and in voice only, including in the Second Shift podcast and in the 2012 tour of the new musical 2010: Our Hideous Future. Eboracum served as the stage manager for the Arisia 2015 production of Mrs. Hawking, and is a founding member of The Chameleon’s Dish Theater as well as a longtime veteran of Brandeis’s Shakespeare troupe, Hold Thy Peace. I’m super excited to work with them, and tell this bit of Mrs. Hawking history! Come join us for our one-night only performance as the opener of Bare Bones 16: At War for piece, The Wheel, written by Zinnie Harris and directed by Jess Viator, on Thursday, March 26th, 2015 at 8pm at Unity Somerville, at 6 William Street, Somerville, MA. 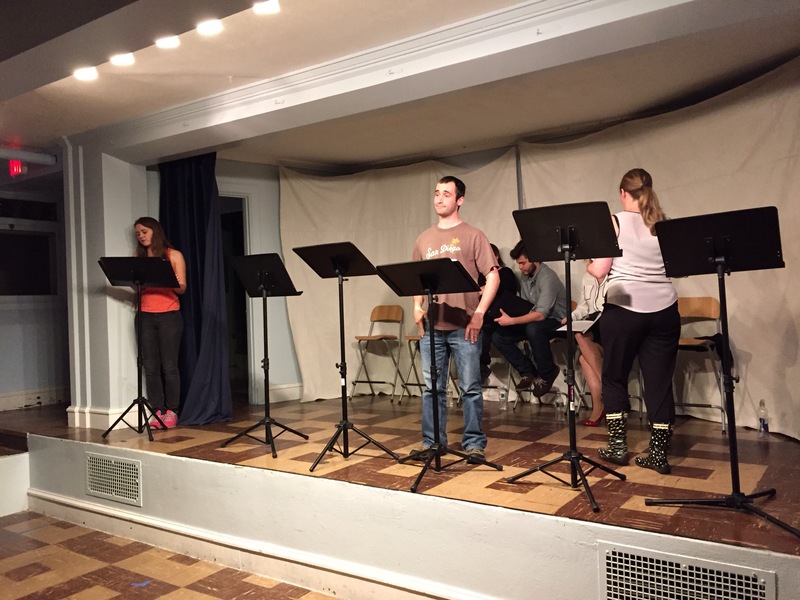 “Like a Loss” staged reading with Bare Bones 16: At War! 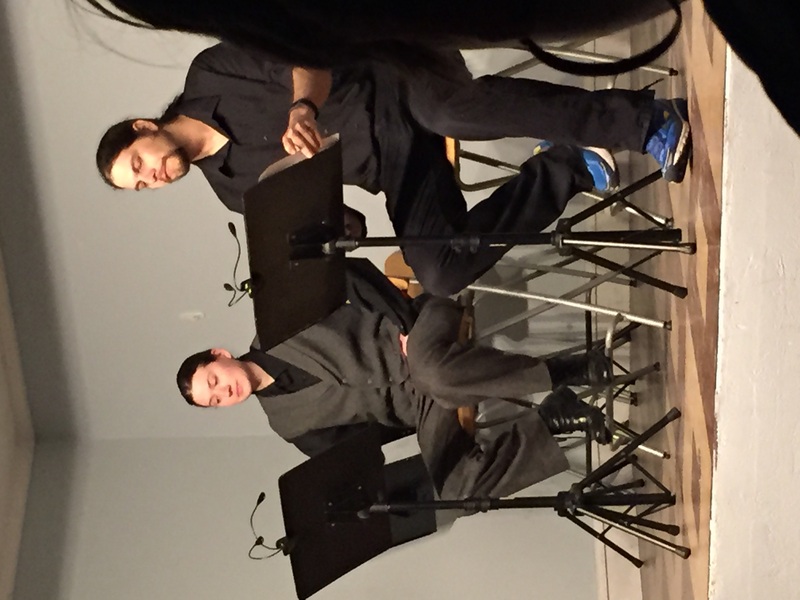 Like a Loss, the ten-minute play accompaniment to the Mrs. Hawking play series, will have a staged reading with Theatre@First’s Bare Bones reading series! “Faithful batman Henry Chapman does not often pry into the personal matters of his employer, the decorated Colonel Reginald Prescott Hawking. But when some of his master’s burdens seem to grow too great, Chapman attempts to understand why Colonel Hawking has chosen to endure conditions as they are. This high-drama short piece will be read in Bare Bones 16: At War, as the opener to the reading of a full-length piece, The Wheel, written by Zinnie Harris and directed by Jess Viator. This is a one-night-only performance on Thursday, March 26th, 2015 at 8pm at Unity Somerville, at 6 William Street, Somerville, MA. Care to be involved? Auditions will be held on Monday, February 16th, 2015 at 7pm at 13 Park Avenue, Somerville by appointment only. If you are interested in auditioning for either of these readings, please go here to fill out the webform for a timeslot. Join us as we tell a little of the story of the mysterious Colonel! 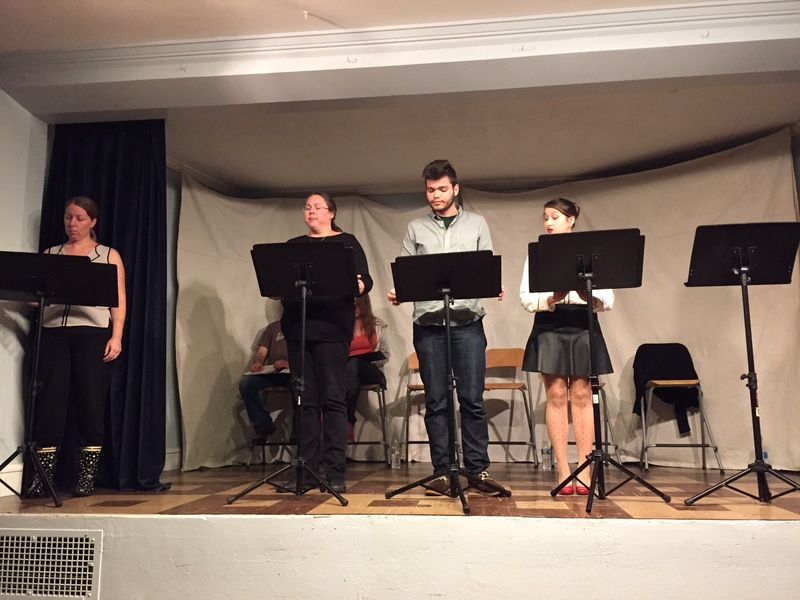 I was extremely pleased with how the staged reading of Vivat Regina went this past Thursday. My actors did such a wonderful job bringing the story to life, I couldn’t have been happier with the representation of my work. I had a very nice audience who reacted appreciatively to it, making me believe the piece is in fact in a solid state. I’m so grateful to everyone who helped make this possible. Readings should not only exhibit a piece, they should also teach you something about it as its writer. What jumped out at me in this more than anything else was that people responded to the humor of it. I expected them to like the plot and character arcs, but I was pleasantly surprised to find that pretty much all the jokes got laughs. And I was told afterward that the funny parts were some of the most enjoyable of the entire play. I would not say I am a particularly skilled comedy writer. But I do understand the value of lightening up a serious narrative with humor. A story like Mrs. Hawking’s, that of a frankly unhappy person acting on their rage and resentment, can easily go too far into the territory of “grimdark,” like Batman at his worst. That can get overbearing and excessively heavy very quickly. So I am extremely happy to hear that not only were my humorous moments in Vivat Regina genuinely funny, but they helped balance the serious parts rather than take away from them. A lot of the humor is based in knowledge of the Victorian period, like when Nathaniel say that Newcastle was his grand military station abroad, so I was concerned it wouldn’t read. But maybe my audience was just smart, because most of it seemed to come across! Also the humor in Mary and Arthur’s banter in the scene with their first meeting seemed to do a lot to make people enjoy it. I very much wanted Arthur to come off as charming, and I think him being an effortlessly funny and sharp-witted guy helped. That scene was very cute, and did a lot to warm people to the relationship to come. One thing I did not rely on was making any of the characters inherently absurd. I want this to be a story about people rather than caricatures, and I don’t want anyone reduced to a punchline. Take Clara, for example. Clara is a major source of comic relief in this piece, with her biting wit and mocking critiques of our hero. But I very much wanted her to be a substantial person whose humor came from the clever things she said, rather than from her being an absurd person. To annoy Mrs. Hawking, she intentionally behaves like a parody of the gossipy, self-absorbed society woman her aunt believes her to be, but it is put on, not her true nature. I was extremely glad to see that read. What I take away from all this is that I should make a real effort in the future to include humor in the Mrs. Hawking stories. That’s a bit of a daunting prospect, as I know comedy is not my forte, but I’m glad to have gathered that information. I want these pieces to be as enjoyable and multi-layered as possible, and the lighter moments really seem to add a lot. Bare Bones staged reading of Vivat Regina tonight! Tonight is our one-night-only staged reading of Vivat Regina at Bare Bones with Theater at First! Last night we held our final rehearsal, which I am pleased to report went well. That was the first time we were able to run through the whole play in its entirety, and it was fascinating to see how the cast used it to carry them through their arcs. More than the original, this is a piece where each scene builds upon the scenes that came before it. It builds up a real momentum that way, where the personal moments and the plot of the caper weave in an out of each other toward their conclusion. I was very proud of the actors for using it to give each character’s story a trajectory. It’s challenging, too, to convey the sense of action and adventure when it’s only a reading, but the narrators reading the stage directions do a phenomenal job telling that part of the story. I think it’s very exciting, even without all the visuals, and I hope you will too. So please join us tonight! Come to Unity Somerville at 6 William Street in Somerville, MA at 8pm tonight, October 2nd. Admission is free, but donations are gladly accepted to support Theatre@First. Meet Elizabeth Hunter, voice of Victoria Hawking in Bare Bones! Meet Elizabeth Hunter, the voice of Victoria Hawking in our upcoming staged reading of Vivat Regina with Bare Bones! Hear Elizabeth’s perspective on portraying the complicated, maddening, and hopefully fascinating lead of our story. And be sure to like us on Facebook! Cast announced for Bare Bones reading of Vivat Regina! 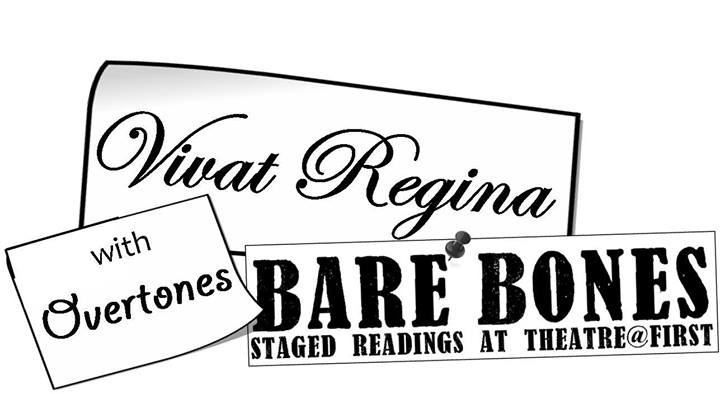 I am pleased to announce that we have a cast for the staged reading of Vivat Regina at Bare Bones with Theatre@First! As I mentioned, the three talented people playing Mrs. Hawking, Mary, and Nathaniel in last year’s Bare Bones reading of the original play were kind enough to agree to return. I am delighted to have Elizabeth Hunter, Gabrielle Geller, and Ryan Kacani reading again. But that meant I still had three other people to choose! This audition process was even tougher than it was last year; I was very fortunate to have a nice selection of talented people, but sadly that meant there were more people I enjoyed than I could possibly use. It’s always sad when you don’t have enough space for someone who gives a good reading and whom you’d be happy to work. I feel very grateful so many people were willing to share their talent with me to put on this piece. Thank you so much to everyone who auditioned; I really wished I had more roles. I am very excited to work with every one of them. I hope you’ll all come out to see this very talented cast read Vivat Regina on Thursday, October 2nd at 8PM at Unity Somerville at 6 William Street, Somerville, MA. “Vivat Regina” to have staged reading with Theatre@First’s Bare Bones! Vivat Regina, the second installment in the Mrs. Hawking series, is going to be having a staged reading with Bare Bones, the reading series hosted by Somerville, MA theater troupe Theatre@First! 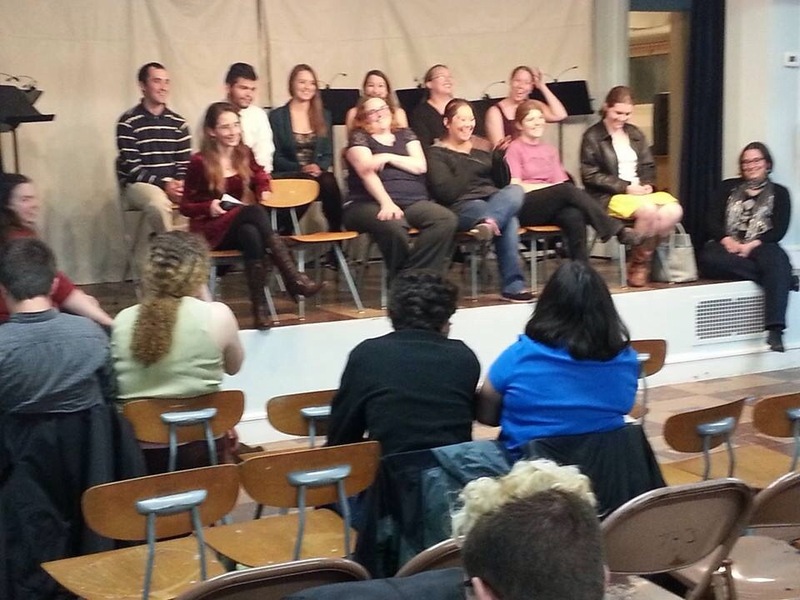 Bare Bones previously hosted a reading of the original Mrs. Hawking in April of 2013, which was performed to great success. I’m very fortunate that the excellent actors who portrayed the three leads, Elizabeth Hunter as Mrs. Hawking, Gabrielle Geller as Mary, and Ryan Kacani as Nathaniel, have all agreed to return to play their characters again in the reading of the sequel. I’m so excited to work with them again! Auditions for the remaining roles will be held on Tuesday, September 2nd at Unity Somerville at 6 William Street, Somerville, MA. I will be looking for one man to read for Arthur Swann and two women, one for Clara Hawking and one to be double-cast as Mrs. Braun and Frau Gerhard. The ability to do a German accent would be welcome for the latter actress but is not required. Any interested parties are welcome and encouraged to try out! If you’re interested in coming out, please go to the Bare Bones website for relevant information and how to sign up for an appointment! The reading will be held one night only, on Thursday, October 2nd at 8PM at Unity Somerville. Admission is free but there is a $5 suggested donation to support Theatre@FIrst. Auditions for Mrs. Hawking reading at McKinney Repertory Theater! The open auditions have just been announced for the staged reading of “Mrs. Hawking” at the McKinney Repertory Theater in McKinney, Texas! They will be held on Friday, February 21st from 6:30 to 9:30 PM and Saturday, February 22nd from 1:00 to 4:00PM. The location is the McKinney Performing Arts Center at 111 North Tennessee in McKinney. The reading will be held on March 22nd at 2PM in the same place. So if you’re in the McKinney, Texas area and would like to help bring these characters to life, go to the audition and give it a shot! Information can be found at the theater’s official site here. Runner up in a new play competition! Yesterday I received news from a new play competition in which I entered Mrs. Hawking. The McKinney Repertory Theater in Texas held a contest searching for the best new play, saying that they would perform the winning play and give a staged reading to the first runner up. That first runner up is Mrs. Hawking! I do wonder if the demands of the set disqualified it from winning because they did not want to undertake a build that big, but I'm very happy to hear it regardless. I love to think that somebody that's never even met me thought it was good enough to take a prize in a new play contest, and I especially like that exposure to the piece is spreading. I really do need to get cracking on that Mrs. Hawking website, and start stirring up as much attention as I can. This reading won't be happening for a while yet, not until March of 2014, so I have plenty of time to direct interest generated by it that way. But still, this is so encouraging, I should really use this to motivate myself.